The Cambridge Singers have been recording steadily since 1982 and although their line-up changes for each project their standard has always remained very high. This is partly because John Rutter tends to source his singers from a pool of recently graduated Oxbridge choral scholars which explains their keen musicality and contributes to their characteristic clarity and purity of tone. They are joined by La Nuova Musica (artistic director; David Bates), a small ensemble currently making a firm entrance to the early music scene. 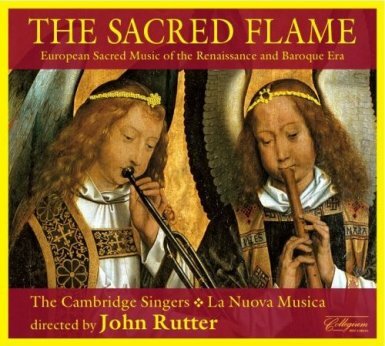 The Sacred Flame is a presentation of religious music from the Renaissance and Baroque eras straddling the Reformation and the Counter-Reformation when churches (Catholic and Protestant) were among the leading patrons of the arts. The programme is shrewdly drawn from John Rutter's own anthology European Sacred Music neatly demonstrating what a useful (and weighty) volume it is. The album opens with Gabrieli's exuberant Jubilate Deo and then Monteverdi's monumental Beatus vir. These performances are joyfully executed with the singers clearly enjoying the voluptuous phrases of the Gabrieli. Beatus vir is a fantastic piece with some beautiful solo singing especially from the two sopranos Amy Howarth and Amy More who blend almost telepathically. In the full choral sections however, I would have preferred a little more meat on the soprano-sound, noticeably in Cantate Domino which comes two tracks later and although beautiful, is a little too polite and maybe even slightly distant. This could well be a deliberate recording and editorial strategy rather than the singers' tone. The next section of the disc comprises unaccompanied works of the Italian high renaissance, Palestrina, Anerio, Gesualdo, and a simply stunning performance of Ave verum Corpus by Lassus which has for too long been eclipsed by more popular settings. The singers exhibit an exquisite sensitivity making this one of the most beautiful choral recordings of such repertoire to appear for quite a while. However, again I would take issue with the balance; here it is the altos that feel slightly underrepresented. I miss the sound of one or two renegade countertenors searing through the texture at key moments and although this all-mezzo lineup is versatile and well blended it lacks that sort of personality. Absolute equality of all voices seems to be an important part of Rutter's vision for his choir but can, at times like this, be a little stifling when one yearns to hear the boundaries of ensemble nudged. La Nuova Musica return for Sweelinck's sprightly Laudate Dominum and Butehude's Magnificat with it's wonderful solos, in particular Melanie Marshall's rich alto phrases. Then the programme visits the music of Victoria, and on to Josquin's Ave Maria - exquisitely poised with the delicacy of spun glass. The programme ends with Shütz and Bach. The double choir setting of psalm 100 finally delivers an exciting texture while Bach's O Jesu Christ, meins Lebens Licht is a fitting closing that gives full exposure to the skill of the instrumentalists notably some really beautiful oboe playing from Joel Raymond and Sarah Humphreys. This is a fine anthology that many listeners will treasure. John Rutter clearly knows and understands this repertoire well and, as a result, the sound and passion of this album stays with you for a long while after listening. I hope that his inspired combination of La Nuova Musica and the Cambridge singers will go on to future projects together.